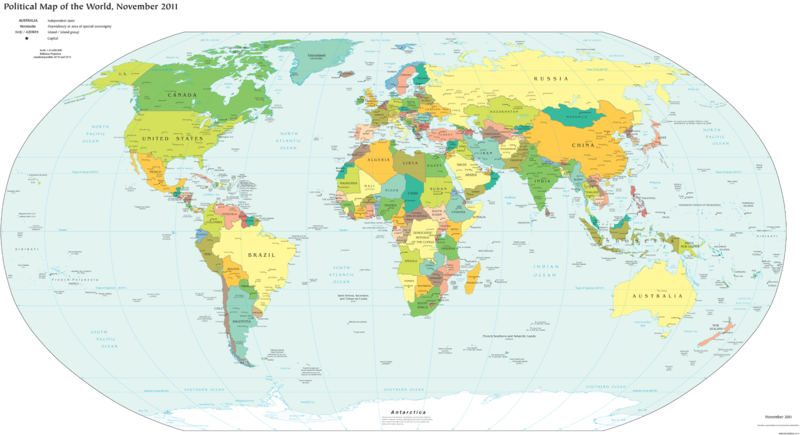 When choosing what counts as a country, most world maps go by either the official list from their own country or the member/observer roster from the United Nations. Just one problem: there are about ten countries which have declared and enforced their independence, but aren't recognized by the U.N. or most of the world's governments. These states may have close ties to a neighbor country, but most of them aren't at all controlled by the country they're supposed to be part of. 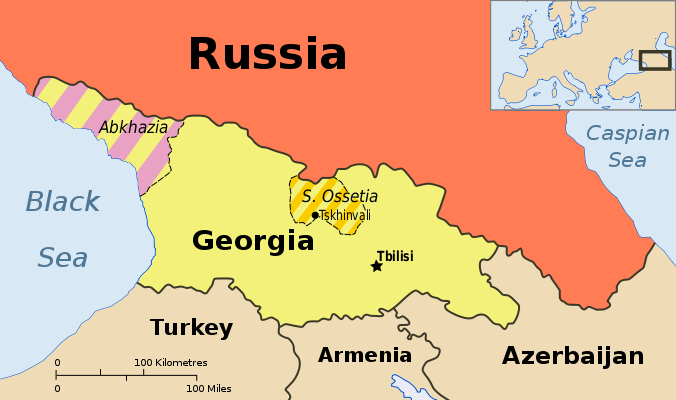 Abkhazia and South Ossetia operate as independent countries, but are claimed by Georgia and only recognized by a few countries. Map by Ssolbergj (CC BY-SA). There are some high-profile special cases that warrant at least a note on many maps. Taiwan's government formally claims to represent non-communist China, though it acts more like a separate country. Palestine, another disputed state, is now recognized as a U.N. observer country despite being forced to share control of its territory with Israel. Western Sahara's status is considered unresolved by the U.N., and a small piece is effectively independent; meanwhile, Northern Cyprus is recognized only by its patron country, Turkey. The self-proclaimed Republic of Kosovo is now recognized by half of the U.N.'s members but not by the U.N. itself. Other countries escape entirely from all but the most careful of political maps, being misleadingly merged into the countries that claim their territories: Abkhazia and South Ossetia into Georgia, Nagorno-Karabakh into Azerbaijan, and Transnistria into Moldova. These four breakaway states are sponsored by neighboring countries, but the most left out of all is Somaliland, which receives no major support or recognition from anyone, despite managing its affairs completely independently from Somalia. Drawing lines around a country on the map might imply that its government controls all the land within those lines. But that's often not the case in reality. Even setting aside foreign military occupations like the recent U.S. interventions in Iraq and Afghanistan, many countries' governments don't control their whole territories. Aside from the cases of breakaway states as described earlier, this mainly occurs in war zones where rebel groups are actively vying for control of all or part of the country. 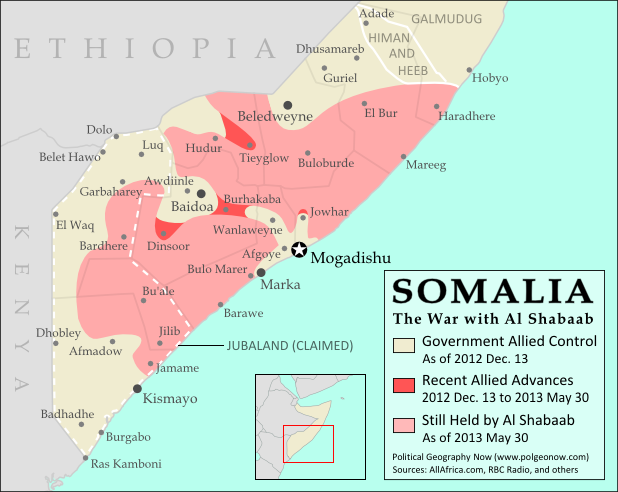 Large parts of Somalia are controlled by Al Shabaab extremists. Click for map attribution info (CC BY-SA). Somalia is probably the most infamous for this. Its U.N.-recognized government controls around half the country at best, and a few years ago controlled nothing but a part of the capital city! The rest is divided between the religious extremist Al Shabaab and various autonomous states which keep their own counsel on whether to cooperate with the government. The territories of Mali, Nigeria, the Central African Republic, Libya, and Ivory Coast have all only recently been reunited (either under the former government or under the rebels), and Syria is the current model of a state falling apart through violence. Other countries with rebels firmly controlling parts of their territory are Yemen, the Democratic Republic of the Congo, and Myanmar/Burma. 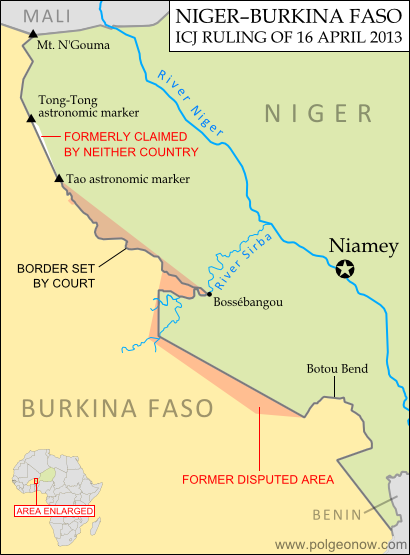 Niger and Burkina Faso recently resolved an unclear border situation. Map by Evan Centanni (click for details; CC BY-SA). Another thing political maps imply is that borders at least have strictly defined locations in principle, even if they're usually invisible on the ground. If they weren't well-defined, they wouldn't all be drawn with solid lines on the map, right? Wrong. Many countries have borders that have never been precisely defined by treaties, a process called "delimitation". Even fewer have been actually "demarcated", or marked on the ground. In fact, undefined borders are such a big issue among the relatively young countries of Africa that the African Union operates an official border program to encourage the ongoing delimitation of national boundaries. The fudge factor in national borders isn't always big enough to make a difference to where they're drawn on the world map - but their fuzziness can sometimes have major effects on international relations. An undefined border is a ripe environment for the birth of territorial disputes when neighboring countries have different ideas of where the border should run. Sometimes these disputes are only low-level disagreements, such as the one recently resolved between Niger and Burkina Faso; but in other places like the border between Sudan and South Sudan, they can escalate into bloody conflicts. Your world map may label a few well-known territorial disputes, caused either by vague borders or conflicts over island groups. You might then reasonably conclude that disagreements over who owns a place, though they do happen, are relatively few and far between. Unfortunately, your conclusion would be incorrect. There are far more disputed territories in the world than you've probably ever imagined. 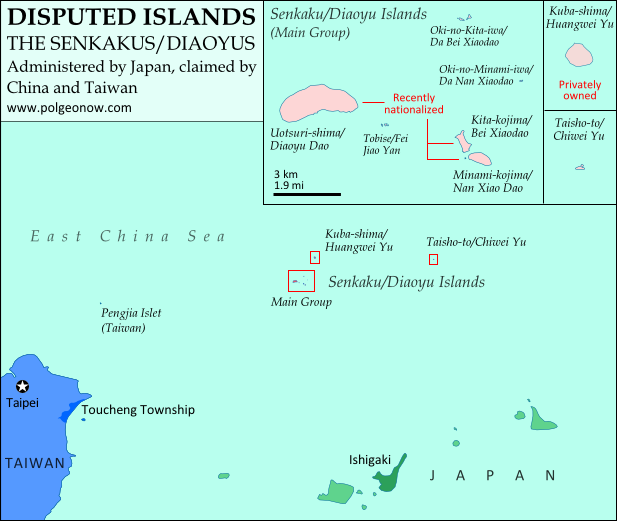 Map of the Senkaku/Diaoyu Islands, disputed between Japan, China, and Taiwan (map by Evan Centanni). The most bizarre disputes range from high-profile cases, such as the five-way feud over the Spratly Islands, to quieter anomalies like Bir Tawil between Sudan and Egypt, both of whom claim it belongs to the other. You may have heard of those, but did you know that (at least on paper) Mongolia is claimed by Taiwan? Or that more than half of Guyana is claimed by Venezuela? What about the several territories disputed between the U.S. and Canada? And those are just the land disputes - wait until you hear about the oceans! One thing completely left off of most maps is ownership of the sea. The occasional border lines you see across straits on your map are just showing who owns the islands on either side, not who owns the sea in between. The uninterrupted expanse of blue on most maps then might imply that the seas are the domain of no country. This is true for parts of the open ocean far from any coastline - but closer in, countries can and do exercise territorial rights over their neighboring seas. According to international best practices, a country is entitled to extend its territory up to 12 nautical miles (NM) out from its coastline, regulate economic activity out to 200 NM, and sometimes control seafloor oil and mineral exploration out to much further. 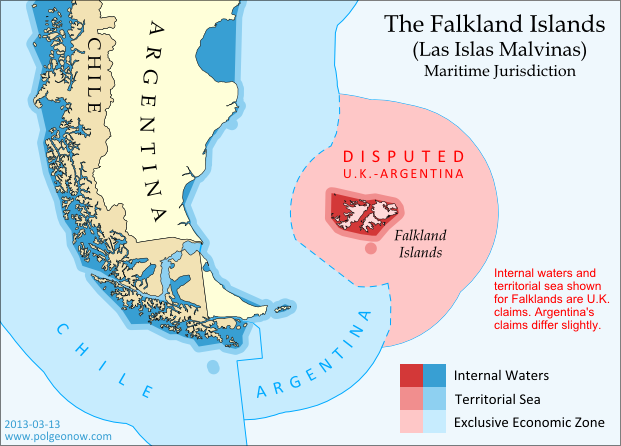 Both the land and the seas of the Falkland Islands are disputed between the U.K. and Argentina. Map by Evan Centanni (click for details; CC BY-SA). But the divvying up of the world's seas is still an ongoing process, and there are probably even more maritime disputes than land-based ones. Some countries, like Peru and Ecuador, refuse to recognize the 12 NM limit, claiming sovereign territory out to a full 200 NM. In even more cases, neighboring countries just can't agree on where to draw the border between their respective territorial seas. International law does provide guidance on how to divide it up, but for now many countries make claims far beyond what seems reasonable, apparently hoping they have something extra to give away in future negotiations. The most extreme claims, like China's infamous "Nine-dotted Line" around most of the South China Sea, don't seem to follow much legal logic at all. So next time you find yourself looking at a political map of the world, remember to be critical and take those borders with a grain of salt! Parade of Nations: Which Countries Are (and Aren't) in the Olympics?